Renner, N. (2017). First Draft and Public Data Lab release guide to savvy reporting on fake news. Columbia Journalism Review. (contribution to an article announcing the launch of A Field Guide to Fake News). Gray, J., Bounegru, L. & Venturini, T. (2017). 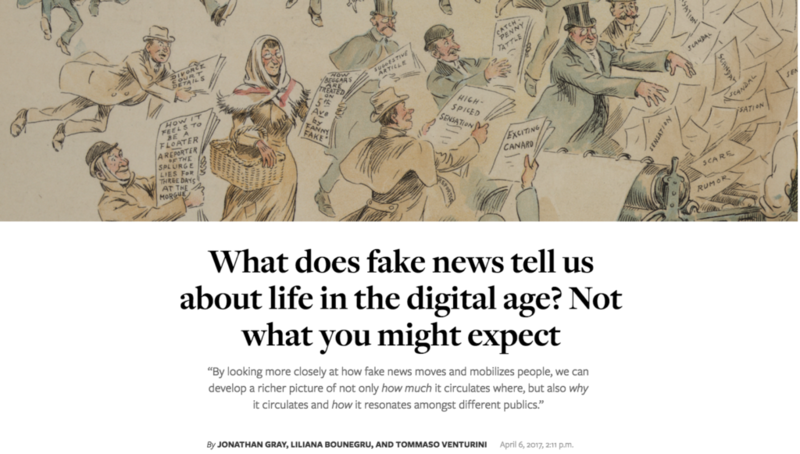 What does fake news tell us about life in the digital age? Not what you might expect. NiemanLab. Bounegru, L. (2014). How Might Digital Newsrooms Utilise Tools Developed by Internet Researchers to Cover Complex Issues in New Ways?. Tow Center blog. Bounegru, L. (2014). What Data Journalists Need to Do Differently. Harvard Business Review. Bounegru, L. (2014). Journalists Should Follow the Lead of Media Scholars and Look to the Internet as a Rich Source of Data. London School of Economics Impact of Social Sciences blog. Bounegru, L. (2013). Learn How to Become a Data Journalist with MOOC, Handbook from EJC. PBS MediaShift. Ršumović, R. (2013). Interview: Theory and Practice of Data Driven Journalism. Mediacentar Sarajevo Magazine. Bounegru, L. (2012). A Brief History of Data Journalism. O’Reilly Radar. Howard, A. (2012). Interview: The Bond Between Data and Journalism Grows Stronger. O’Reilly Radar.